After the Restoration work was completed in 2007, Blast Off! (the children’s group) listened and collected stories about the project, and about what St Michael’s means to its congregation. This is what they found out …..
What is so special to you about St Michael's? St Michael’s was built between 1881 and 1883. It is made of material that won’t last forever, unless they are looked after. That’s why the restoration project was started, in order to make the church strong and attractive for the future. St Michael’s was the first church in the presbytery to have a condition report. We needed a million pounds – that was about 1990. There was terrible despair. Then we had a Wish Meeting on a freezing night in February. We knew the church was not going to fall down, so we put our own priorities first. They were: 1. Heating in the halls. 2. Toilets (there was only ONE downstairs). 3. Heating in the church. Painting came further down and we never believed we could get as far as stonework. But by breaking it down into manageable chunks of work we began to see that we could do it. One elder said, “It’s not given on a plate; we have to struggle.” And we did and had fun too and grew together. To raise money for the Restoration, we used to sell things at local markets. But, that was really hard work because you were always moving stuff from one place to another. So, after a while we negotiated the use of local shops for the period in between leases. We had 5 altogether; although not all at once! People all around about in the area would give us things to sell, as well as what people in the church contributed. We changed the windows every Saturday, and once we’d been there for a while, people would come into the shop especially to ask after the health of other folk that they knew that we would know about. It became a real community outlet. The Yummies went carol singing around the parish where we knocked on doors collecting money for the restoration. We would be dressed as snowmen, Christmas crackers or victorian carol singers. People came out of their houses to listen and watch us. We were not sure whether the money was given to us because of our appearance, singing or the flame torches that the men carried. It was always a cold evening but soup was ready for us back at the church. It is very skilled work to repair a building like St Michael’s properly. The workmen used traditional hand tools, and had to make sure that the bits of stone and the lead on the roof all fit together perfectly.The restoration has made the building beautiful inside. The lighting shows off the craftsmanship of wood and stone. The light through the stained glass is pleasing to the eye. Adding to the beauty are details like the pulpit and altar falls, the inner doors, the lighting in the side aisles, the warm-coloured carpet, banners etc. It’s hard to remember what it was like before the restoration started but it looks lovely now. Can you think of a special memory about St Michael's? 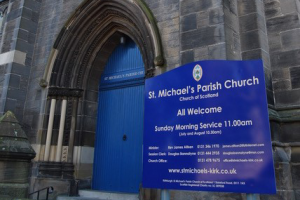 What are your hopes for the future of St Michael's?